Cerebral palsy is a group of disorders that affect a person's ability to move and to maintain balance and posture. The disorders appear in the first few years of life. Usually they do not get worse over time. People with cerebral palsy may have difficulty walking. They may also have trouble with tasks such as writing or using scissors. Some have other medical conditions, including seizure disorders or mental impairment. Cerebral palsy happens when the areas of the brain that control movement and posture do not develop correctly or get damaged. Early signs of cerebral palsy usually appear before 3 years of age. Babies with cerebral palsy are often slow to roll over, sit, crawl, smile, or walk. Some babies are born with cerebral palsy; others get it after they are born. 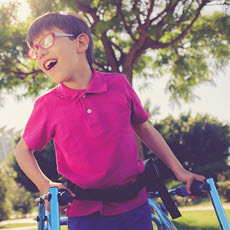 There is no cure for cerebral palsy, but treatment can improve the lives of those who have it. Treatment includes medicines, braces, and physical, occupational and speech therapy. Article: Cerebral palsy in adults: summary of NICE guidance. Article: Neurodevelopmental Follow-up of Preterm Infants: What Is New?